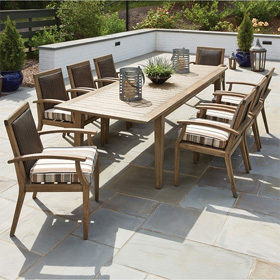 The OW Lee Lennox patio bar set includes 4 stools and the pedestal table with custom order frame colors. The Lennox collection features a durable modern steel frame and mesh seating surface that makes it low maintenance and perfect for commercial or residential use. Frames constructed from top-quality steel. Mesh table top features convenient umbrella hole for and built in pedestal base. Custom order frame color: Choose from a variety of powdercoat finishes. Bar Stools 25.5"W x 26.75"D x 44.75"H 39 lbs. Bar Table 34"L x 34"W x 41"H 146 lbs.